I know many of you have hauled a rock or two or even three. I know your forearms burned and your biceps felt like they would burst. And you thought to yourselves – not another working bee! When will this track ever be finished. And now it is! All good projects must have a good official opening. So on Saturday 6th June, we will be toasting the project and all involved. 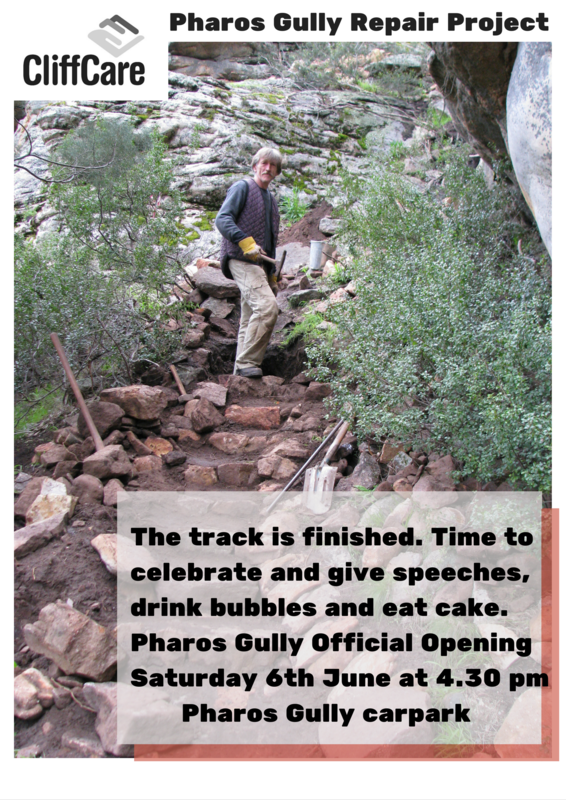 Come along to the Pharos Gully carpark where we will cut the climbers sling, have a drink, eat some cake and mutter a few words of big thanks to all involved. This entry was posted in Uncategorized and tagged arapiles, cliffcare, friends of arapiles, fundraising by Tracey. Bookmark the permalink. Great to see this project carried to a successful conclusion. Sorry I can’t be there for the celebrations. Enjoy the bubbles!